There’s never enough polka-dots and ric-rac. Ever. 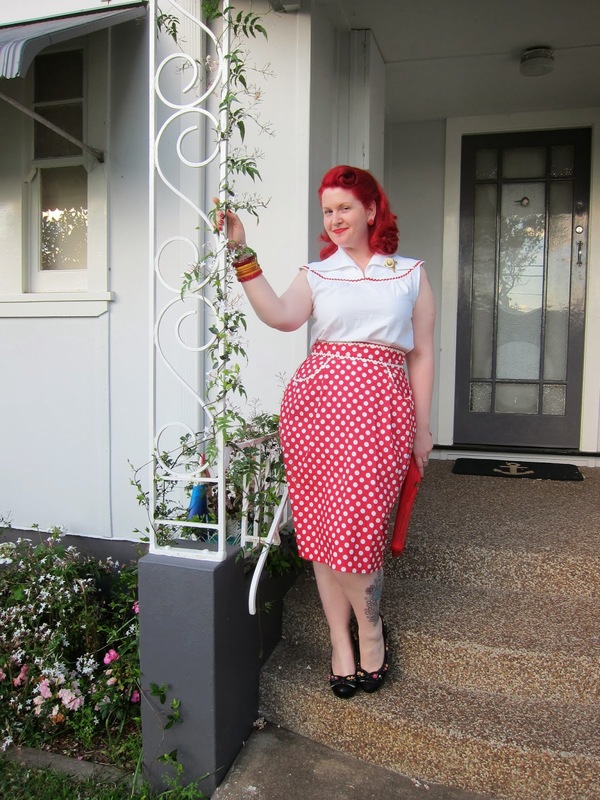 Abby from BlueGingerDoll showed me her latest skirt design I knew straightaway it would be right up my alley. And when she asked if I would mind test sewing it – how could I say no? Presenting the Peggy Skirt! This design has some great elements – popped pockets and three waistband options. 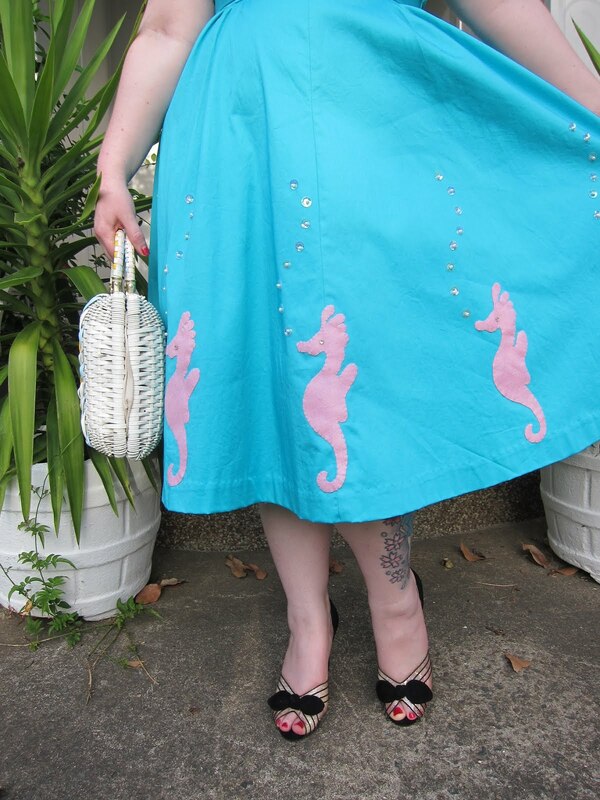 To me, it works as a casual late-40’s skirt, but it could be styled for a 1950s or 1960s look quite easily. 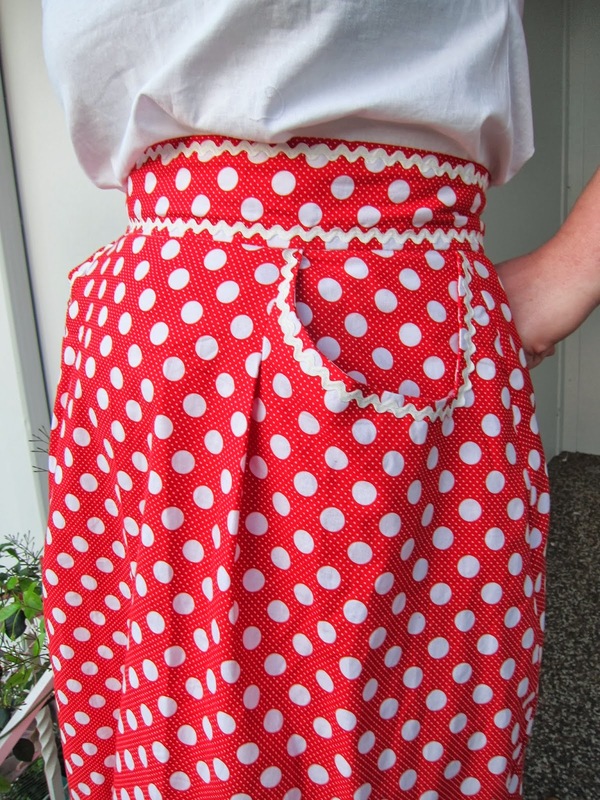 It’a also aimed at entry-level sewists, so it’s super quick and easy to make (I whipped mine up in a few hours). The fit is really flattering, flared enough to be comfortable but not so flared that it will fly up in a stiff breeze. Spotted quilter’s cotton, Lincraft, 2012. 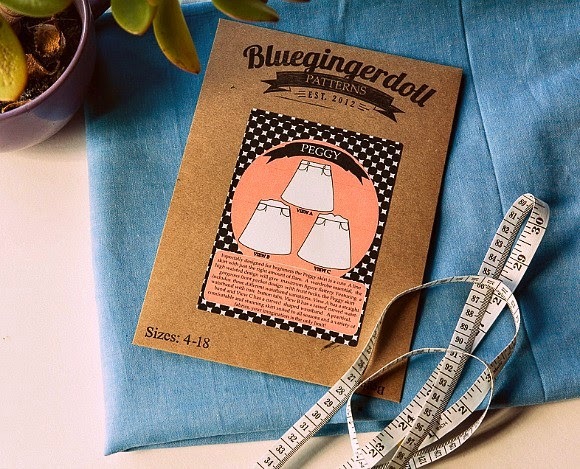 My fabric recommendation for a summer Peggy Skirt would be a medium weight fabric, such as quilter’s cotton, homespun, drill, feedsack cotton, chambray or polished cotton. I think it would great in gaberdine for winter too. – Graded from a size 14 waist to size 16 hips. – My love affair with ric-rac continues (Ricky), and trims the edge of the pockets and around the waistband. Definitely something I would sew again, and it only took two meters/yards of fabric (always a plus). 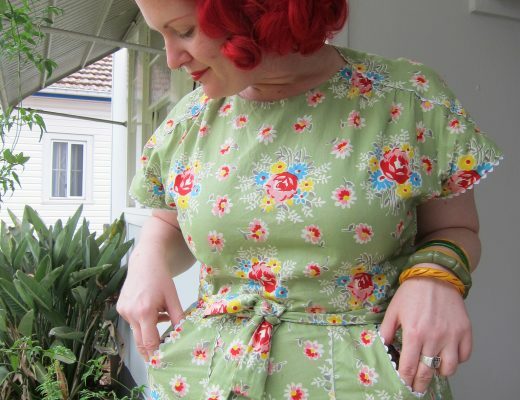 I’m on the lookout for two matching 1940’s feedsacks to make another. 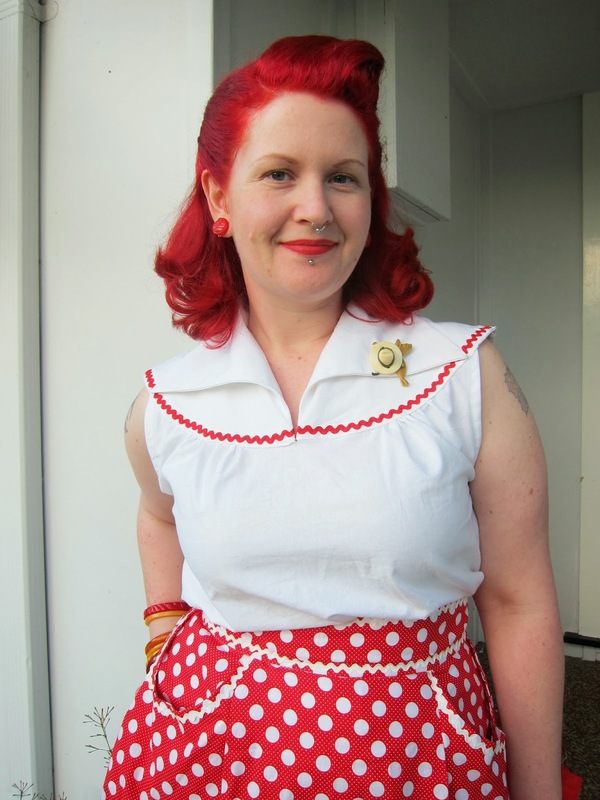 The only problem I encountered was not having an amazing blouse to wear with my new skirt! I’ve had Mail Order 4820 sitting on my sewing table for a while (along with 20 other patterns) and thought now was probably the time to give it a go. 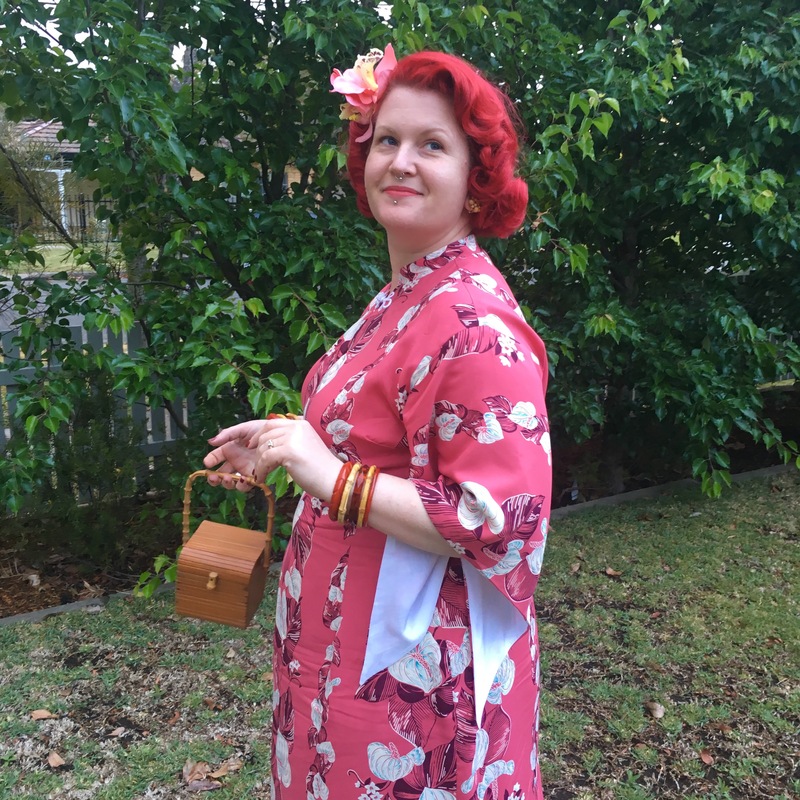 I love 1950’s playsuits, and this is the first time I’ve even come close to making one. The western feel of the blouse pattern seemed the perfect fit for the Peggy skirt (with mandatory ric-rac trim again). – The blouse has more ease in it than in pattern picture – I didn’t grade up for my bust (39 inches), and ended up taking it in a bit at the waist and hips for a better fit. – The arm holes were a bit tight on my muslin, so I lowered them. 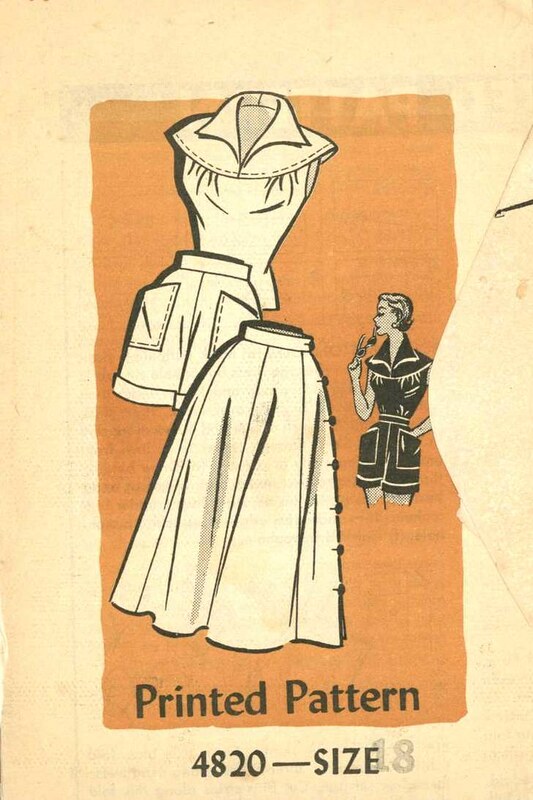 Does anyone find it hard to find the perfect blouse to wear with 1950’s circle skirts? I think this is the winner for me – light for summer, and good for dancing. I want to say a big thank-you to Abby for letting my try her pattern out, it’available right here on her new website. Plus if you use the code PRETTYPEGGY2013 you’ll get 10% off Peggy until 11 October – all of her patterns include free worldwide shipping too. You look adorable and the top is perfect. I love ric rac but have a hard time figuring out placement so it doesn't look too childish. I would love to wear a blouse like that but I don't really like to show my upper arms. I do love off shoulder blouses like no ones business. I want to make one in each basic color. Oh I just love this outfit – it looks great on you. I like the detail around the skirt pockets. Top is lovely too and the brooch is a great addition. i told you already that i love the blouse. but this top together with this skirt is absolutely great. fabulous summery look. I LOVE that skirt. I also love your hair. What do you use to color it? I have been trying to get mine an intense red, but I have had problems getting there. It's a bit of a process – bleach the roots (for vibrancy) and then tint over the top of that (for permanency, I use 7.66 with red enhancer). I follow up by using a stain (Manic Panic Rock and Roll Red) to keep the colour nice. I've just discovered Crazy Colour, much cheaper and lasts for ages so I'm swapping over from MP ;).